My kawila, my faithful kawila, used to have all kine stickers on it. Like “100% Tita”, and “Live Aloha”, and “Aloha Happens”. But today it is bare. Nomo da IZ sticka on da side window. Hakum? Cuz dis kawila get 173,000 miles on it and it’s tired. It’s taken us to California twice when my mom wen mahke. In it, we wen take da Montana Road Trips, twice, chru Washington, Idaho, Montana, Wyoming, and back again. I wen take her up to Bellingham to see my hānai sis four times ova da years. 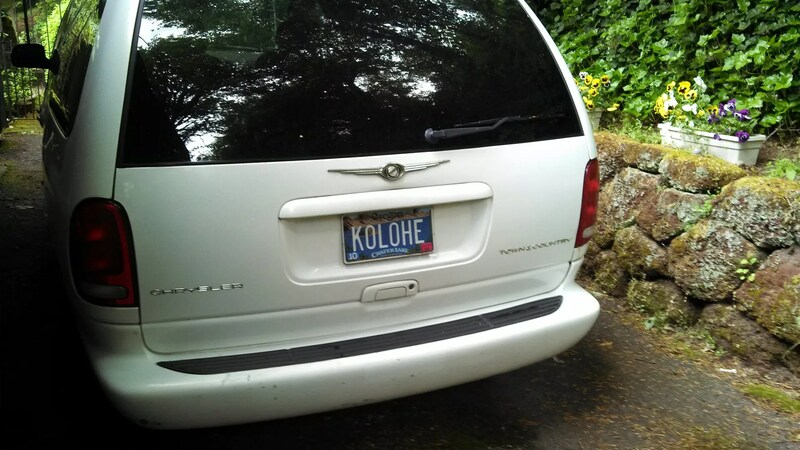 We wen go holoholo kaʻa to Eastern and Central Oregon. Da kawila has been packed full to da roof wit stuffs from my mom’s hale and it’s da most comfortable car I eva wen ride in. It’s carried dogs and cats in it, and even two lambs. It wen take me to several Alohaworld mini-gatherings in Washington, and it’s da car dat two of my hānai braddahs wen help me get one new battery into. Aside from normal maintenance and an alternator and water pump, dis kawila hasn’t given me a minute’s pilikia. Faithful to da max dis kawila. We wen buy her used eleven years ago. But now she’s tired. Da electrical system stay going wacko at times. And so now is da time foa say “aloha ʻoe” to dis friend, dis car I love, dis car dat wen carry us on all kine advencha. So Nolemana wen take off alla stickers. He wen vacuum it foa me and wen wash it foa me in preparation foa trading it in. He doesn’t undastand hakum I’m so emotional about a car. But I am. No can help. Da car is bare now. But I neva going forget her. Neva going forget da miles we wen travel togedda all ova da Northwest back again. I love dis kawila. And I get plenny wai maka about letting her go. It’s ok~I understand….but you will have more adventures with a new one. Maybe more lambs or goats or a llama or two. Aue. So sad. But you get to keep da license plate, right? Tink of all da new stickahs you goin’ put on yo new kawila!